Dear development team. First of all my respect for this nice component! Now I have a feature request regarding the JS pop-up calendars in the Check Availability Module; is it possible to integrate a realtime availability calendar in here, which checks if the hotel is fully booked for a certain dates and disable those dates in the calendar? That would be a super cool feature, because customers can already check (basic) availability. Yes it is already in our plan for v1.0.0. Thank you. When is this new version due? Current version is v1.1.0, but it is not yet available? Or am I missing a setting somewhere? Thank you for following up, our initial plan was to add it in v1.0.0, however it did not work well because it slowed down the whole system a lot because it has to check for availability for every single dates. Because of this performance issue, we had to hold it back until we find a better solution. 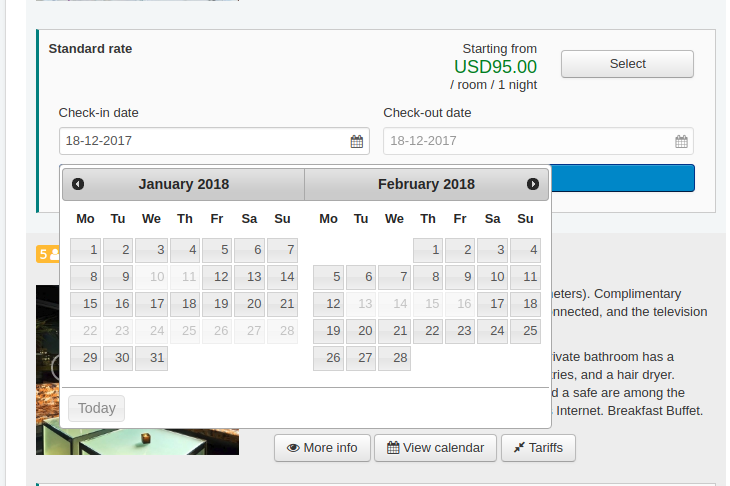 Starting from v2.6.0, the room type's datepicker will show unavailable dates (fully occupied or blocked by Limit Booking plugin ) in real time (screenshot), please stay tuned. Combined with Flex Search plugin, it will enhance the guest booking experience a lot .